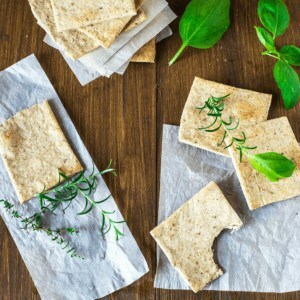 This homemade almond herb cracker recipe is the perfect crunchy gluten free and paleo snack. Healthy snacks are not always easy to find, so it is always better to prepare them at home. I am much more into salty and savory food for snack time. I prefer to keep sweets for dessert. Therefore I’m always trying and testing new recipes for savory bites to enjoy between meals. 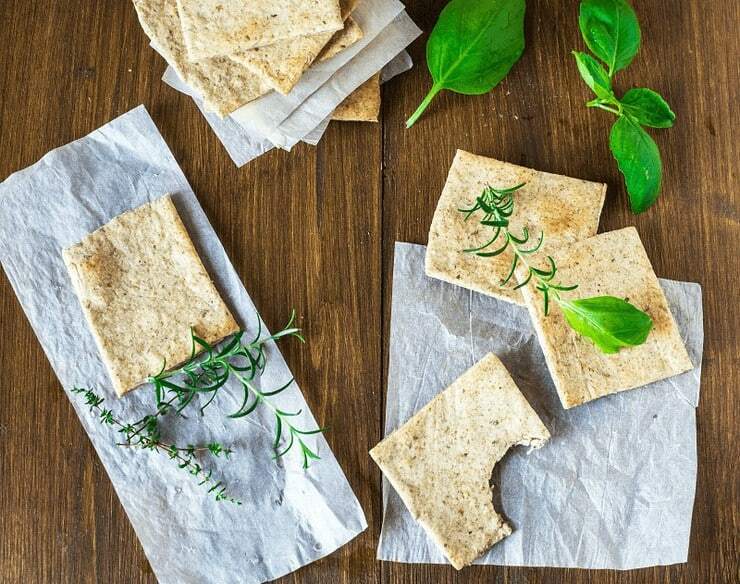 As you can probably imagine, I’m kind of in love with these crackers because they have a strong herbal flavor, a great taste, and the perfect consistency. They are crunchy and delicious, plus they don’t have a single trace of grains or processed ingredients inside. What’s not to like? And the best part is that you can get extremely creative when cooking them: replace the herbs with spices like curry or turmeric, add garlic or onion, seeds, crushed nuts or even make them spicy by adding chilies or cayenne. Your toppings can be creative too. Top with cheese, almond butter, paleo thousand island dip or dip into tahini! The recipe is very easy to cook and it will take about 15 minutes to prepare plus 10 minutes for baking. 25 minutes of your time for a great snack? Totally worth it! 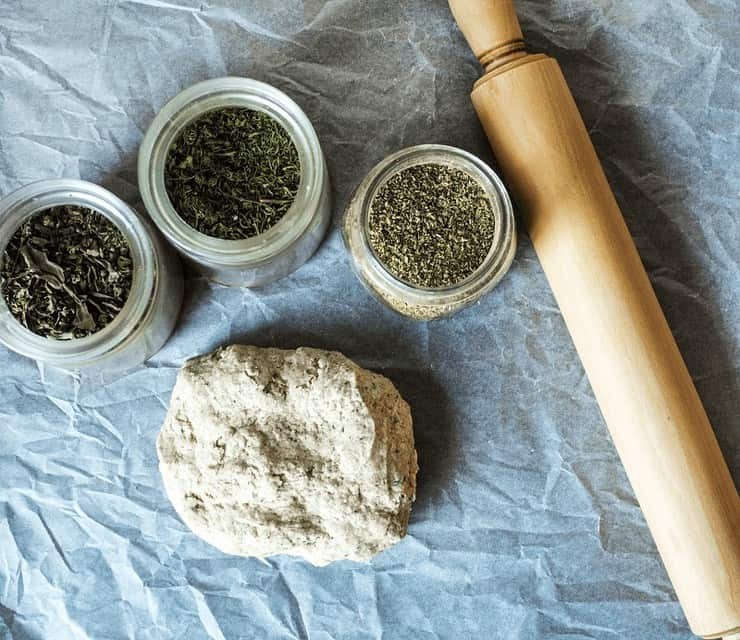 You will also benefit from the great flavor and healing properties of dried herbs such as basil, rosemary and oregano. Preheat the oven to 350F. Place the flour, herbs and salt in a large bowl. Stir to combine. Add the butter and water. Mix until you have a quite elastic dough. If you need more moisture, simply add a little bit of water. Place it between 2 sheets of parchment paper. 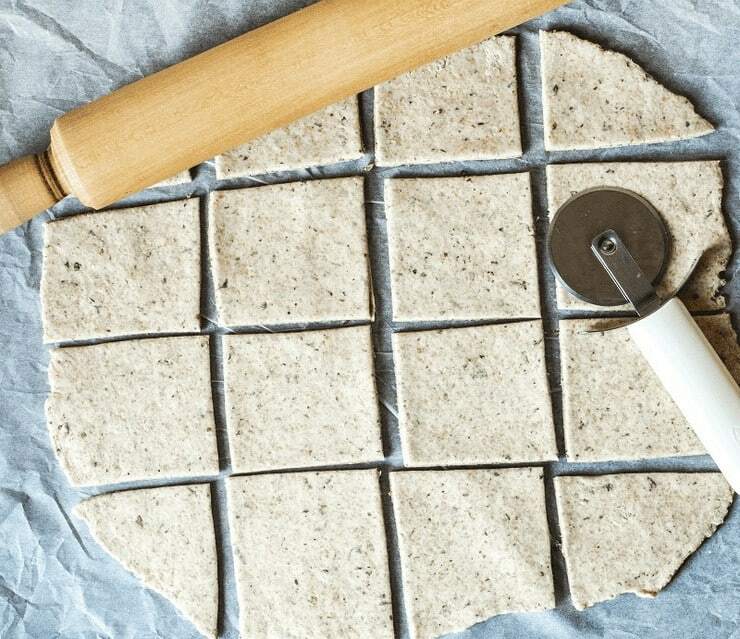 Use a rolling pin to spread the dough until 0.1 inch thick. Remove the top paper and bake for 10-12 minutes flipping over after 6 minutes. Transfer on a wire rack to cool completely before serving. 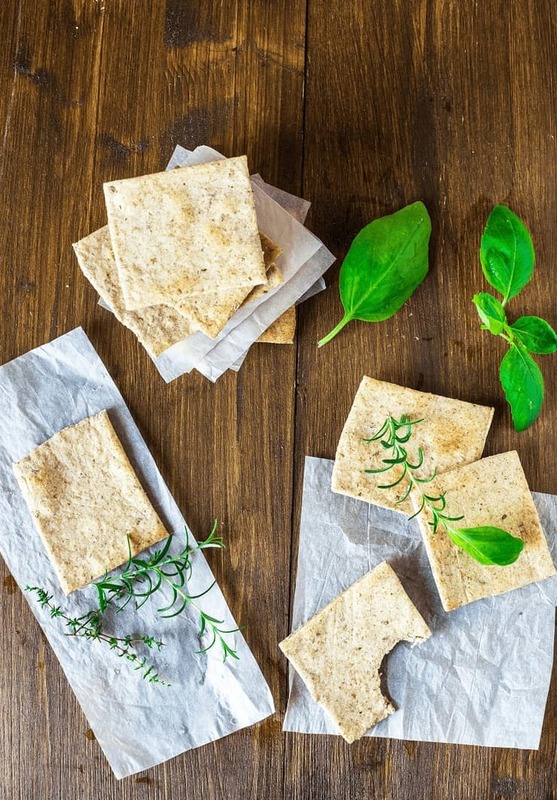 I have always wanted to make crackers and these look lovely! They appear to be light and delicious. Wow, can’t believe how easy these look with almond flour and just a few other ingredients. Can’t wait to try! 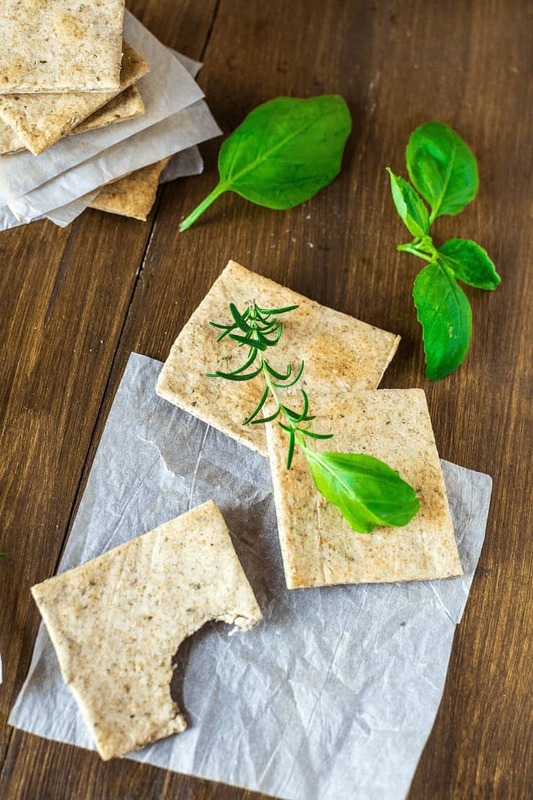 this looks so easy and crackers are so great to snack on while working. your pictures would like me to do the effort even more to make these. Every year I say I am going to mke my own crackers and I never do. I will be giving these a try for sure! These would be great to bring to any party. Tasty for everyone! I don’t believe I’ve ever made crackers, besides oat cakes (if you consider them crackers)! These look and sound delicious! Perfect with cheese! 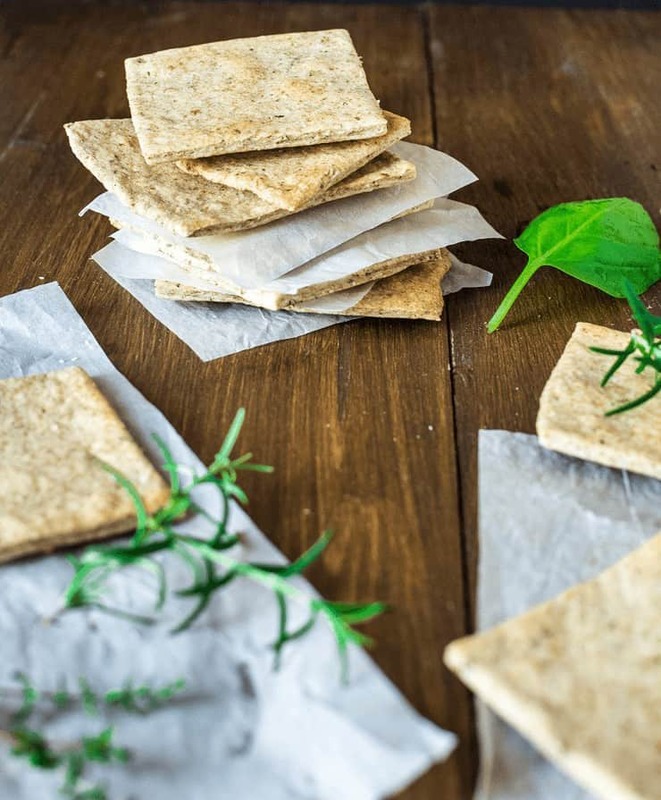 I never thought to make my own crackers. You make it look so easy. These are fabulous! I have tried several other keto cracker recipes and these are much better! My question is- it is very humid here in Toronto in the summer, how can I keep these from losing their crispiness? Glad you enjoyed them! I haven’t had an issue with them losing their crispness before, but maybe you could try keeping them in a container or sealed bag with a paper towel to keep away moisture. Or maybe put them in the toaster oven for a couple minutes before eating them? 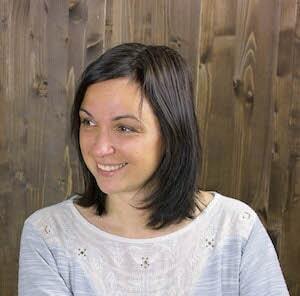 I thought you can’t have dairy on paleo. Can you use ghee as the butter? 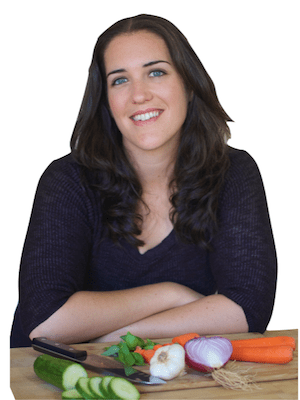 Paleo is no dairy, but butter is considered ok on paleo, but you can use ghee instead if you prefer.